Fall is All About the Layers: Shepherds Pie – Pao Says, "Open Wide!" My mom recently sent me the ingredients to an out-of-control pumpkin cake. Naturally, I figured it would be best (for my thighs) if I didn’t take down the whole cake by myself. Who better to share food with than good friends? So I wanted to make a dinner dish that would be pretty simple to make, delicious, and easy to feed multiple people with… Not to mention, a nice precursor to the perfect Fall dessert I had up me sleeve. (Not to worry, that recipe will be up soon too). Since it was my first time making Shepherds Pie, I took from Alton Brown’s recipe and tweaked it to my own taste. Enjoy! Peel the potatoes and cut into 1/2-inch dice. Place in a medium saucepan and cover with salted, cold water. Set over high heat, cover and bring to a boil. Once boiling, uncover, decrease the heat to maintain a simmer and cook until tender and easily crushed with tongs, approximately 10 to 15 minutes. Place the half-and-half and butter into a microwave-safe container and heat in the microwave until warmed through, about 35 seconds. Drain the potatoes in a colander and then return to the saucepan. Mash the potatoes and then add the half and half, butter, salt and pepper. And 1/3 cup of Gruyere with 2 slices of Swiss cheese and continue to mash until smooth. Stir in the egg until well combined. While the potatoes are cooking, prepare the filling. Place the olive oil into a 12-inch saute pan and set over medium high heat. Once the oil shimmers, add the onion and carrots and saute just until they begin to take on color, approximately 3 to 4 minutes. Add the garlic and stir to combine. Add the meat, salt, pepper, and herbs and cook until browned and cooked through, approximately 3-5 minutes. Sprinkle the meat with the flour and toss to coat, continuing to cook for another minute. Add the chicken broth, Worcestershire, and nutmeg and stir to combine. Bring to a boil, reduce the heat to low, cover and simmer slowly 10 to 12 minutes or until the sauce is thickened slightly. Just looking over this recipe makes my mouth water. Yukon Gold Potatoes are one of my fave foods. They deliver a natural butteriness that russet potatoes lack. If you’ve never tried them, then take them for a spin on this recipe. 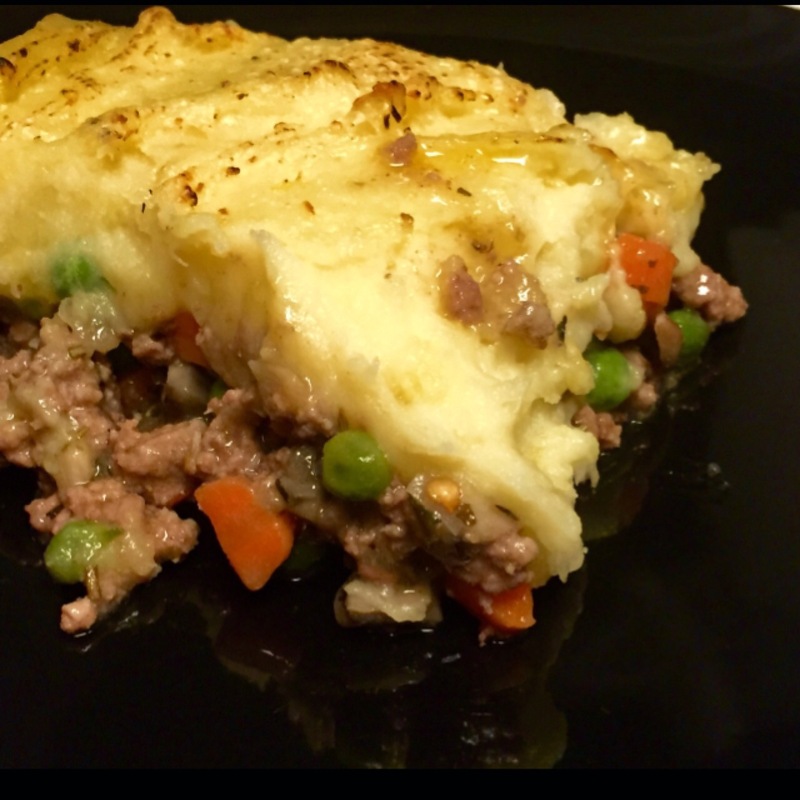 Delicious shepherds pie, very interesting recipe!